Water Liberty works in partnership with Trees For The Future. For every pack of NanoTowels you purchase at Water Liberty, we'll plant a tree on your behalf. Since October 2018, Water Liberty has planted over 182,300 trees in underprivileged communities. Together we can make a difference. Q: Your literature says that the NanoTowels® can help replace cleaning chemicals in the home. How does this work? A: In most cases, you need to use two NanoTowels–one wet and one dry. For example, if you are cleaning glass and want to avoid using glass cleaner, just scrub the dirty glass with a damp NanoTowel, and then go over it with a dry NanoTowel for no streaks and crystal clear glass. The same goes for stainless steel, wood and just about everything else. They are particularly good for dusting. Use them for dusting, washing counter-tops, floors, bathrooms, glass, stainless steel, spills Also, they are great for washing a car because they are so soft, they will not scratch the clear-coat, and they absorb a huge amount of water. Q: How do the NanoTowels® reduce the amount of paper towels we use? A: Believe it or not, one of the biggest uses for paper towels is drying your hands after washing them. Leave a NanoTowel by the sink, and you will immediately reduce a significant amount of paper towel usage. A cotton towel won’t be an adequate replacement, because they only absorb a limited amount of liquid and practically never dry. 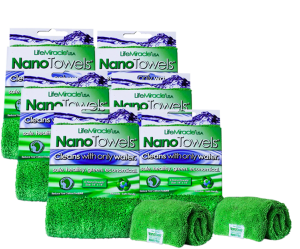 The NanoTowels also clean up spills quickly and completely. One NanoTowel can do the same job as half a roll of paper towels. Paper towels are also used extensively in household cleaning. So if you replace paper towels with NanoTowels for just these three uses, you will eliminate the vast majority of your paper towel usage. Q: Won't the NanoTowels® get dirty after cleaning? A: Of course they do! But unlike paper towels, you can wash them and use them over, and over and over again. You can just hand wash them in warm water throw them in the washing machine with your normal colors. Do not use bleach or fabric softeners. These can destroy the unique cleaning characteristics of the NanoTowels. Q: Do the NanoTowels® kill bacteria, etc. on the surfaces that I clean? A: The NanoTowels can only disinfect to the extent that regular hot water and cleaning disinfects. 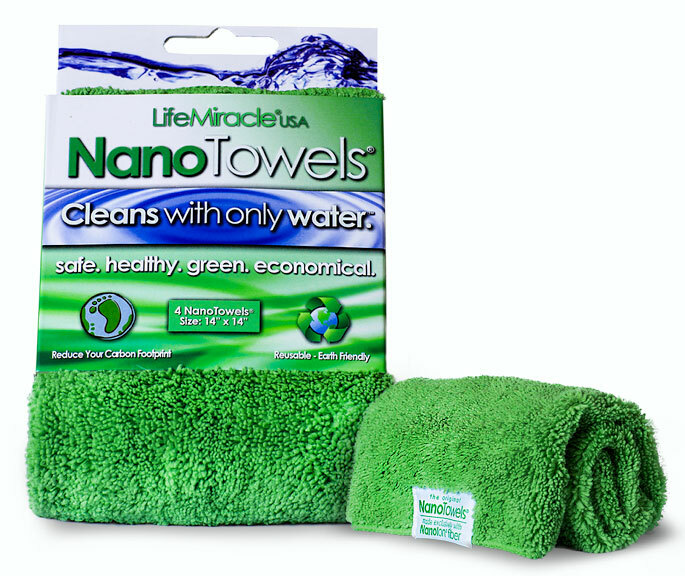 Most household chemicals are not used to kill microorganisms, and neither are the NanoTowels. And chemicals that perform this function are extremely toxic and should never be used around food or people. The cleaning process itself washes away most bacteria, if you use hot water. A great all-natural solution: Numerous studies show that a straight 5 percent solution of white vinegar—such as you can buy in the supermarket—kills 99% of bacteria, 82% of mold, and 80% of germs (viruses). So all you need to do is keep a spray bottle on hand of diluted white vinegar, and use it on areas you want to disinfect. Q: Can I use cleaning chemicals with the NanoTowels® if I want to? A: Yes. You just have to remember that many household chemicals are toxic for the environment and health, so try to limit the amounts that you use and the frequency of use. With that said, you will be amazed at how many surfaces come totally clean using only the NanoTowels and water. Over time, you may find as many people have that you really do not need to use chemicals at all. Incidentally, a great alternative to toxic cleaning chemicals is simple white vinegar and baking soda. Q: What about smell? Will the surfaces that I clean have a nice, perfumey scent with the NanoTowels®? A: There is no scent added when using the NanoTowels. The truth is, clean surfaces smell like nothing. They don’t smell like perfume. And most people significantly overkill with these scents. They use all kinds of scents throughout the home, including in their cleaning chemicals. This is simply too much for human beings (especially children) and pets to handle. Breathing in toxic chemicals all day will only make you sick. Sometimes the body will rebel with rashes, respiratory issues or illness. You need to be aware that most household chemicals are very unhealthy for your skin and respiratory system, so the less you use, the better off you are. Some of those red eyes, rashes and runny noses are not because of allergies, but due to the perfume and petrochemicals left behind in your home after cleaning. Q: How long will my NanoTowels® last? A: Generally, your NanoTowels should last between two to three years, or 300-400 uses. They also come with a full 1-year warranty. Q: What is the warranty and risk free trial all about? A: Since the NanoTowels may be a new concept to you, we take all risk out of trying the product and comparing it to your favorite household cleaners and paper towels. And once you’ve tried the product and love it, we also guarantee the quality of the product with our 1-year warranty, and still give it to you at a very reasonable price. 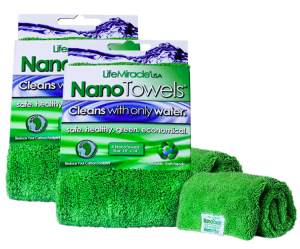 Q: What sort of benefits can I expect with the NanoTowels®? A: Many benefits. Most importantly if you or your family suffers from cleaning chemical related sensitivities like skin problems and/or respiratory issues, you owe it to your health to switch to our non-chemical alternative product. From a financial standpoint, you should be able to save hundreds of dollars a year on chemicals and paper towels. You will also save time cleaning, and will reduce your effort by avoiding lugging a dozen chemical bottles and a roll of paper towels around the house while you clean. It makes your home more “green” and also more child and pet friendly by reducing the amount of toxins in the home. It may have a massive impact on the environment by less chemical dumping and reducing our dependence on foreign petrochemicals (Yes, your cleaning chemicals, and the plastic bottles they come in, are petrochemicals derived from crude oil). Q: Can the NanoTowels® be used in applications outside the home, like for commercial purposes? A: Absolutely. The NanoTowels can be used in industrial applications, wherever cleaning is done. Hospitals, nursing homes, hotels, restaurants, schools, military, etc. ALL are great places to use the NanoTowels, and enjoy all of the cost savings and other benefits listed here. You can also use them to clean the inside and outside of vehicles like cars, trucks, boats, RVs, buses, etc. Q: I have heard of ||microfiber|| towels before. Is this the same thing? 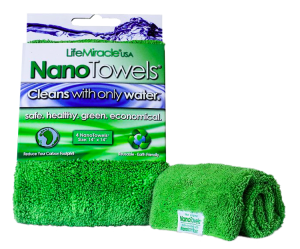 A: The NanoTowels are NOT made from microfiber and have nothing at all to do with microfiber. Microfiber is a very common material that is adequate for some applications, but Nanolon® fiber is a new, state of the art, next generation fabric technology that will perform like nothing you have ever seen or used before. Nanolon® is manufactured using a unique, proprietary complex methodology and protocol, and you have never seen or heard about anything like it before. Its unique properties are what set it apart from anything that has come before it. If we were you use an analogy, microfiber would be comparable to a VHS videotape, and Nanolon® fiber would be comparable to a state-of-the-art 3D Blu-Ray disc. If you have any additional questions about our NanoTowels, don’t be shy. Contact us today and our amazing representative will get all your questions answered. Copyright © 2019 Waterliberty.com. All rights reserved.